Live blog on RTÉ.ie and the RTÉ News Now App from 6.30pm on Saturday and from 1.30pm on Sunday. Mayo v Roscommon live on Eir Sport on Saturday from 6.30pm. 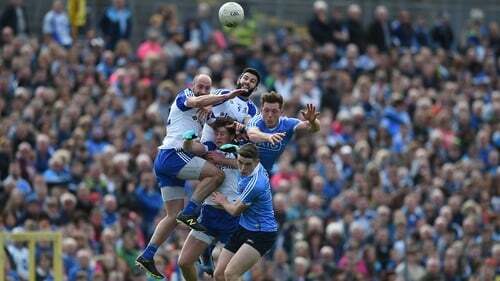 Monaghan v Dublin live on TG4 from 1.30pm. Highlights of all the weekend's action on Allianz League Sunday on RTÉ2 and the RTÉ Player on Sunday, 9.30pm. All live game also available on GAAGO. Saturday: A cold and windy day with showers, which will be most frequent over the western half of the country. Mild to start, but getting colder later, with top afternoon temperatures of 6 to 8 C. Southwest winds will be strong and gusty. Sunday: The day will start windy with ongoing strong and gusty northwest winds. Most places will be dry with sunny spells. However, showers will affect Atlantic coastal areas and some will be of hail. Afternoon temperatures of 5 to 8 degrees with an added wind chill. For more, go to met.ie. And so we begin again. After a winter where the current state of Gaelic football got more than its fair share of coverage across the media platforms, it's not too alarmist to say that 2019 could be a defining year for the code. Most are of the view that the league works well, where teams are grouped according to their strengths. The prophets of doom are largely silent in these spring months. Such voices, however, become audible once the summer fare begins. It's clearly not a level playing pitch come championship time. For many counties, their 'championship' kicks off this weekend and will conclude on Sunday, 24 March. Yes, they may hope for an extended run in the qualifiers come June or July, but gaining promotion out of the bottom two tiers would ultimately represent a productive year. While, football is not yet at the point of being labelled the GAA's 'problem child', in spite of what some experts think, it needs to give us a few more thrills along the way. Dublin are dominant at the moment, but that dominance won't last forever. Kerry, as things stand look best equipped to knock them off their perch, but there are at least half a dozen other teams who are building towards something. This upcoming league may tell us that the current power rankings remain the same - the top four in Division 1 last year were the subsequent All-Ireland semi-finalists and seven from the top tier took their place in the inaugural Super 8s - or it may show signs of life in counties that have recently fallen down the pecking order. To that end, much focus on Cork, Meath and Derry in the weeks ahead. It's a second coming for Horan after the somewhat messy departure of Stephen Rochford. The ultimate goal remains the same, but a solid league campaign, where Mayo's attacking intent garners a few headlines would be a positive way to start the year. A surprising appointment some might say, but Cunningham's experience in managing both codes should stand to the Rossies as they strive to survive in the top tier. The Kingdom did not play in the McGrath Cup, so no early clues as to how the former minor coach will set his side up. There is no doubting that Keane has much talent at his disposal and the Kerry inside line is probably the most lethal in the country. Tighten things at the back and the Green and Gold could have a really good year. Graham is double-jobbing at the moment, with one eye also on Mullinalaghta's All-Ireland semi-final in mid February. It could be a long spring for the Breffni if they don't get something from their early home games against Kerry and Roscommon. This could be a good appointment for Down, with Tally getting much praise after previous coaching stints with Tyrone, Galway and St Mary's College. The Wee County go local after a disappointing end to Pete McGrath's stay. Kierans managed the Louth U20s last year and in 2017 guided the county to a Leinster minor final. Another local appointment, but Davis may find the going tough without the Mullinalghta contingent for most of the league. Staying in this competitive section would be a feather in his cap. Maughan moves on to managing a fifth county. It's a tough ask, and he has been vocal about getting players to commit to the Faithful cause. The midlanders have silverware in the bag after winning the O'Byrne and Cooney will now be expected to mastermind a strong promotion push. The Yeats County turn to a former player in their quest to make them genuine promotion challengers. Taylor will do well, however, to keep Sligo afloat given that key players, including rising star Red Og Murphy, won't be available. Cavan were a competitive force during Hyland's time in charge and something similar will be required in Leitrim to see them have any chance of getting promotion. Whelan's 2019 focus is solely on the league and squaring up to sides of a similar level.